Diamond Halo Engagement Rings are one of the most sought after designs of the modern day, and with such an interesting history, it's easy to understand why brides-to-be are choosing to go for this beautiful Halo ring setting. The diamond halo ring is a ring with a setting that encircles a center diamond, surrounded by a collection of round pavé or micro-pavé diamonds. In some cases, the diamond can be encircled by faceted coloured gemstones. What makes the this timeless design truly unique is the high-carat handcrafted center diamond - it demands attention and looks tremendous in a halo setting. People love diamond Halo engagement rings as one of the features is that outer diamonds actually make the central diamond look a lot bigger; resulting in a show stopping piece. The Halo Diamond Engagement Ring has a really indepth history, and preliminary designs surrounding the Halo ring dating back to early the Georgian times (1714-1837). The ring saw slightly smaller diamonds or pearls surrounding the central diamond stone. During the Victorian era (1837-1901) a popular Halo style ring imitated a flower. Coloured jewels such as Sapphire was used as the centre stone, surrounded by triangle cut diamonds. 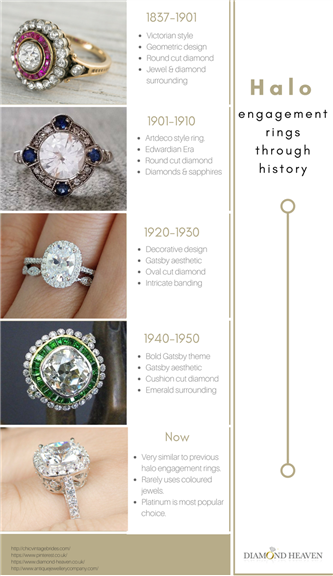 Halo Diamond Rings Throughout the Decades. However, the Halo Diamond Ring as we know it today holds more similarities to the 1920's, where the chic and elegant initial design was a truly stand out piece. This decorative and aesthetically pleasing ring featured beautiful rounded or cushion cut central diamonds were either a rounded or cushion-cut design and the diamonds, surrounded by intricate and smaller round diamonds, giving the appearance of an opulent picture frame, resulting in a truly elegant engagement ring. During this particular period, jewellers started utilising variations of gems and diamonds that they had at their disposal for the show stopping center stone. This stones included: Sapphires, Rubies and Turquoise. They also began to use various kinds of patterns such as milgrain and filigree, which are still used in modern day Halo Engagement Ring designs. During the 1950's, the style of diamond halo rings became much more luxurious, and the past generations made a comeback in popular fashion. This included the increase of colourful flourishes, that had graced our presence in the Victorian era. As jewellery designs progressed into the 1960's and ‘70's, these unique stand out styles continued to develop. However, during the 1980's and ‘90's the classic Halo Engagement Ring started to decline in popularity. However, there's been an increased demand for vintage items of the 21st century, seeing a surge in popularity for the classical design of the Halo ring - it's now at the top modern day fiancee's wish lists. Styles and designs are constantly changing, but at this moment in time the classic design is a popular choice, whether this choice is here for the long term, we are not sure. But what we do know is that it's a truly magnificent, elegant and timeless style which we are sure will never completely go away, as history as so well proven. Can you Resize a Diamond Halo Ring? In theory you can resize any diamond ring, but it does come with its risks. Stretching a ring can damage it if you haven't gone to a reputable jewellers, and the only way to make a ring smaller is to cut into the ring shank. If you have a halo ring with gems around the band this can be a challenge, but a reputable jewellers should be able to do so without damaging the structure of the ring. Kaley Cuoco had a stunning diamond halo ring when she was engaged to Ryan Sweeting. This stunning cushion cut diamond surrounded by gemstones gave a modern twist on the classic halo diamond ring design. Katherine Heigl's stunning pear cut diamond halo engagement ring is a unique twist on the halo ring design. Josh Kelley gave her this beautiful ring, and we're in love with it. American Actress Molly Sims has a stunning cushion cut diamond engagement ring that's truly one of a kind. Gifted by husband Scott Stuber, we're a little jealous! One of the most popular choices of metals for a Halo Engagement Ring is traditionally 18ct White Gold or Platinum, but you shouldn't just stop there, as there is a huge variety of Halo settings available. A fantastic choice for a Halo Engagement Ring is 18ct Yellow Gold, as it subtly compliments a huge selection of gemstone colours and diamond cuts in particular. Two-tone settings are also a very popular choice amongst people nowadays, as they have a slightly modern twist on a classic metal colour and it can be a truly complementary choice for all diamond settings. Similar to Solitaire Engagement Rings the Halo Engagement Ring can feature a number of truly beautiful diamond cuts such as: Round, Princess, Ovals, Emerald-cut, Pear, Cushion Cut and Marquise diamonds. When choosing a particular diamond cut, it's very important to do a little background research on the true meanings of particular diamond shapes, to see if it truly matches your loved one's personality and more importantly style. Whatever cut you decide to choose, we can assure you it will be a truly eye catching piece and will also give you the extra radiance that you're looking for. Should you have any questions about our Halo Engagement Ring range of its history then please contact us today or book a consultation with one of our experts.